To generate leads for your business. Leads are the lifeblood of consulting businesses. If you can’t generate new leads and turn them into paying clients, you won’t stay in business for long. 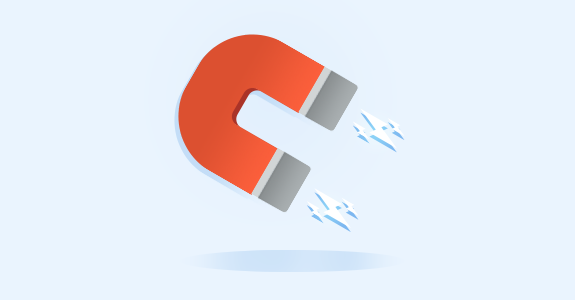 One of the best ways to generate leads is to use lead magnets on your website. A lead magnet is a free piece of content that you offer website visitors. You offer them this content (your lead magnet) in exchange for their name and email address. Think of your lead magnets as material that creates “lightbulb moments.” After reading or watching one of your lead magnets, a lightbulb should go off in the head of your lead. You want to bring about awareness of a problem or a potential solution with your lead magnet. To receive your lead magnet, they sign up to your list. Once they do, your email marketing software automatically sends them your lead magnet. If someone signs up for your list, they’re interested in what you have to offer. They are a new lead. Your email marketing software compiles all lead information into a list. Each new lead is giving you permission to market to them. You can now build a relationship with them via email. As a consultant, your email list isn’t just a bunch of email addresses. It’s a list of your leads. You can send both educational content and promotional content to your entire list all at once. An email list allows you to build relationships at scale. This is why email marketing has an average of over 3000% ROI. Tapping into your list, building relationships, and educating your leads will get you more clients. But before you get to that point — you need to get potential clients to sign-up to your list. Most website visitors never return, so it’s critical that you get as many as you can to sign up to your list. In this article, you will learn 6 different lead magnets to offer on your website. These lead magnets are especially powerful for consultants because they position you as an expert in your industry. When you position yourself as the trusted advisor to your target market, they will come to you when they have problems they know you can solve. You can’t start more sales conversations with your potential clients without building trust — and lead magnets help you generate more trust with your prospects at scale. If your website isn’t generating leads, offer one of the lead magnets listed below. They help you educate your potential clients, grow your email list, and position you as an expert. Lead magnets provide an easy, scalable way to get more leads for your consulting business. Offer one of these bonuses (especially on your resources or newsletter page) and watch your opt-in conversion rate go up. NOTE: These aren’t listed in any particular order. Consider your resources, your industry, and the investment required. For best results, pick the one that helps your potential clients the most. A 5 day mini-series or course is an educational series of emails. It is “dripped” one email at a time to your new lead over 5 days. This can be as simple as text content. Or, you can add images, graphs, and links to your website. The goal with this lead magnet is to educate your subscriber on a challenge they are facing. Your mini-series or course should educate them on how to solve one of their problems. The mini-series or course positions you as the expert on the topic you teach. If you are teaching them how to solve a problem, this lead magnet demonstrates your expertise. Consulting, coaching, teaching, and training have a lot of common. A mini-series or course capitalizes on this overlap. You help coach, teach, and train them over a 5 day period. You can also prompt your reader at the end of each email with a question. Ask them what they are struggling with or what challenges they are facing. Encourage them to “hit reply” and ask questions so you can develop a relationship with them. If you have written a book or eBook, you have an excellent lead magnet. There’s a reason why Alan Weiss calls books the golden standard for consultants. If you’ve written a book on your industry, then you have put a ton of time and effort into it. Books are incredible positioning tools. They make a great introductory offer to move your potential clients up your sales ladder. This lead magnet doesn’t have to be a 50k word book that you sell on Amazon or in print. It can be a 10k word eBook you’re willing to give away for free in exchange for a name and email address. It’s hard for anyone to say no to “free.” Especially if you’re giving away information that can help improve your lead’s condition. 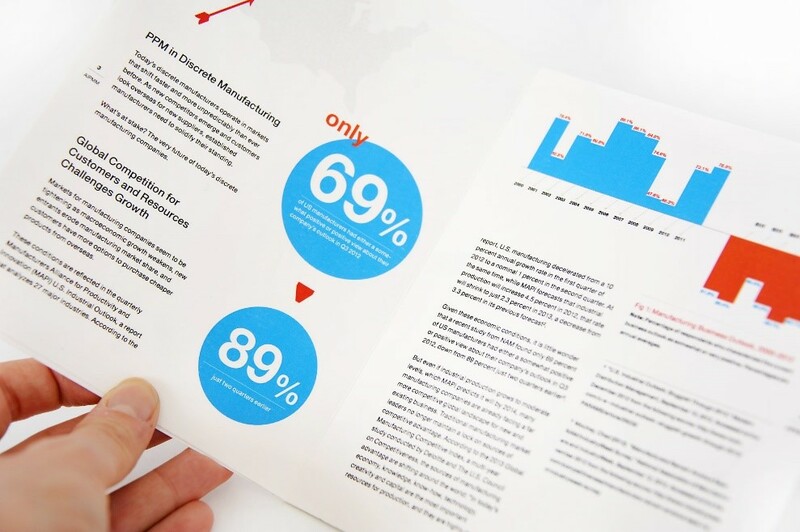 A whitepaper is a report or guide that helps readers understand a particular topic better. For consultants, writing a report can be a helpful way of clarifying your own research. It can help you get crystal clear on your own strategies and methods. If you’re going to write a whitepaper, why not offer it as a lead magnet on your website? If potential clients are looking to learn about a particular topic, why not be the one to teach them? Hinge Marketing does this to perfection on their website. Notice how they use reports and whitepapers as lead magnets. A whitepaper shows that you have done your homework. It’s a perfect way to start a relationship with a new lead. A webinar is a video presentation or workshop. Webinars are often streamed live. Whether you stream webinars live or not, you can use the recordings as lead magnets. Video content is easier to digest than reading through a whitepaper or eBook. It allows your subscriber to be lazy, sit back, and watch the show. A webinar also allows new leads to see and hear you. Each new lead will get to know your face, your voice, and a sense of your expertise. Setting up a webinar takes some technical know-how, but you can make it simple. Use your webcam and PowerPoint to make an educational video, and offer that as your lead magnet. This lead magnet is like giving each new subscriber a private video presentation. If you prefer talking on the phone to writing emails, then offering a 30-minute free consultation is a viable lead magnet. This takes the least amount of preparation and resources. You won’t have to do any writing or recording to offer this bonus. It’s also not scalable like the previous four lead magnets. That said, there’s no doubt that taking the time to call a new subscriber for a free consultation will leave a lasting impression. At some point or another, you’ll have to get on the phone with leads to turn them into clients. This bonus goes straight to authentic, human communication. The new “subscriber” you offer this consultation too becomes a business relationship. If you can provide valuable insight and help educate, free consultations will take you closer to the making the sale. Your goal with your lead magnet isn’t only to educate — it’s to bring awareness to a problem or solution to your prospective buyer. There is no better way to do this than with a checklist or a quiz. Both of these do a great job of helping your potential client become aware of their problems, pains and frustrations — as well as there wants, hopes, and aspirations. Offer a checklist or a quiz that your potential client can go through to see if their business may stand to benefit from your expertise. What are the signs in their business that they are suffering from the problem you solve? What are the signs in their business that they could significantly improve their bottom line with some of your help? You know the answers to these — but your prospective clients don’t. Through a checklist or a quiz, you can help educate your buyer, bring their problem to a head, and prime them for a conversation about how best they can use you. DO: Make this offer clear on your website. If you’re going to offer a bonus for opting into your newsletter, make it clear. Make it one of the first thing the reader sees when they visit your website. Put it up as the primary call to action on your homepage. 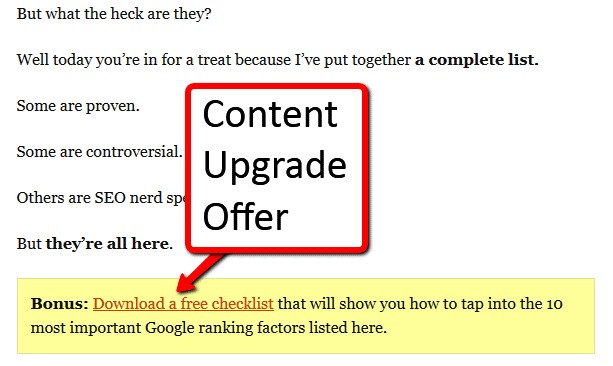 Use a pop-up to offer them the bonus on your blog articles. Tucking away your lead magnet in the corner of your website won’t do you any good. This is “selling from your heels”. You are offering them something valuable that can improve their condition, so don’t be shy about presenting your offer. This image shows a non-clear offer. Notice the weak copy and generic call-to-action. If this opt-in sits in the bottom right-hand corner of your website, you’re missing out on a ton of leads. SumoMe tested their opt-in software, and pop-up optin boxes converted the best. If you want the most leads, use a pop-up. If your offer is quality and relevant to your visitor, they won’t mind. Prospects annoyed at your pop-ups don’t see the value in your lead-magnet, and wouldn’t make good leads anyways. Focus on the leads who do need what you have to offer. DO: Use more than one opt-in. If you’ve written a certain article that brings you a lot of traffic, offering a lead magnet specific to the topic of that post will boost your conversion rate. Brian Dean of Backlinko used what’s called a “content upgrade” to boost his conversion rate by 785%. A content upgrade is a post-specific resource. If a potential client comes to your website to read one of your articles on a certain topic, then offering an opt-in bonus on that topic will entice her more than a general one. You can mix and match your lead magnets on different parts of your website. The better you can match your offering to what your potential clients read on your website, the higher your conversion rate will be. This will take more time and effort, but the results are worth it. DON’T: Use intrusive ads on mobile. The only time you want to be more discrete with your lead magnet is on mobile. Google has cracked down on what it calls “intrusive ads”. Pop-ups, while fine on desktops, are frustrating for users on their phones. If you use too many on your website that makes content less accessible, your website won’t rank as high. Before setting up your lead magnets, make sure your designer or developer knows not to use intrusive ads. These provide a poor user experience. If you want to position yourself as a trusted advisor, your website should be easy to read and navigate. Consider your ideal client for a second. What is one thing they are struggling with in their business? Come up with a few ideas that would help your ideal client solve this problem. Then, review this list. Think about which lead magnet would be easiest to create for your business. Most importantly, consider what would be most helpful to that ideal client. If your business already has resources, then you’re already a step ahead. Use one of these resources as a marketing tool to capture new leads. The more enticing your offer is, the more leads you will get through your website. The better your lead magnet, the warmer your leads will be. These lead magnets will generate leads and grow your email list. Then it becomes your job to use your list to start building relationships. Continue to nurture and educate your list of leads. Ask them about their business challenges. Talk to them about what they are struggling with and how you can help. And when you’re taking on new projects, announce it to your entire list.